20161217 + Up in the am and getting some things done. 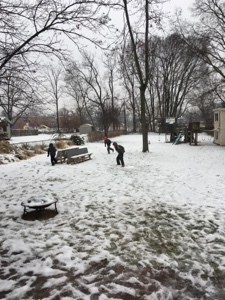 The boys headed outside to take advantage of the first real snow. They had a huge snowball fight and slipping and sliding all over. I headed out to play some football with them for a bit. All back in and I took J to his soccer game. We were late because the VP was in town for John Glenn's funeral. It was J's last game and they lost, but he likes it. While we were out J&I went to a car dealership to learn more about the VW trade-in. There were some pretty exotic cars at this place and J set off the alarm on a Ferrari :-o Even after J's theft attempt they let us test drive a car. On to the Scout store to pick up some awards. Home and had dinner and watched the new Tarzan. After the movie we all played games until bedtime.